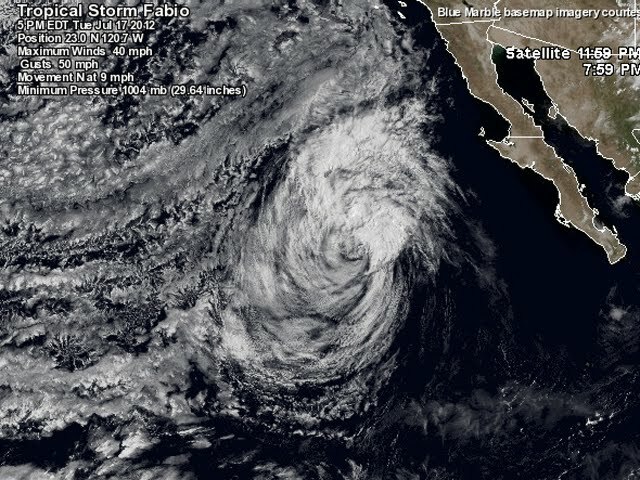 At 800 am PDT the center of Hurricane Fabio was located near latitude 18.9 north/longitude 119.9 west, about 1130 km WSW of the southern tip of Baja California with maximum sustained winds of 120 km/h. Fabio is moving toward the northwest near 8 mph...13 km/h. A turn toward the north is expected on Tuesday...and this motion is expected to continue through early Wednesday. Maximum sustained winds have decreased to near 120 km/h with higher gusts. as it moves over much cooler waters. Sells generated by Fabio are spreading northward along the West Coast of the Baja California peninsula and are expected to reach the extreme Southern California coast by tonight. These swells are likely to cause dangerous surf and rip current conditions.